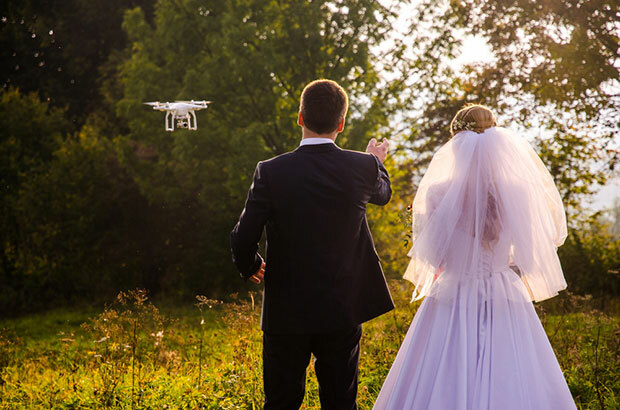 Do you plan to shoot your next wedding ceremony with a drone? 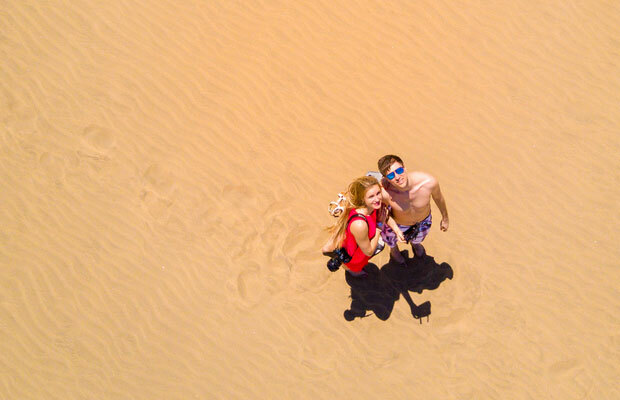 More and more photographers are using drones for aerial photos of the couple and their results are amazing. 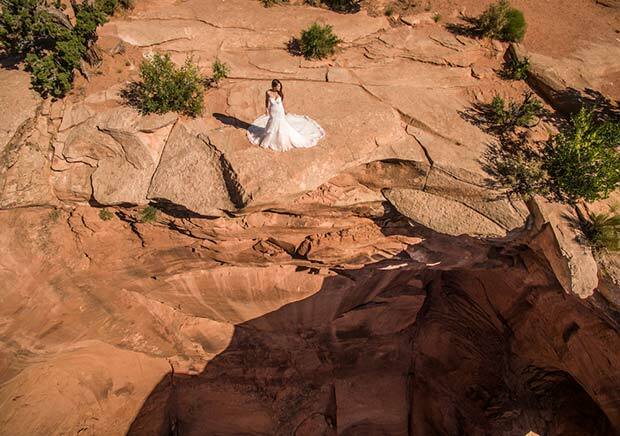 In this guide, we will share the best aerial wedding photography poses for couples. 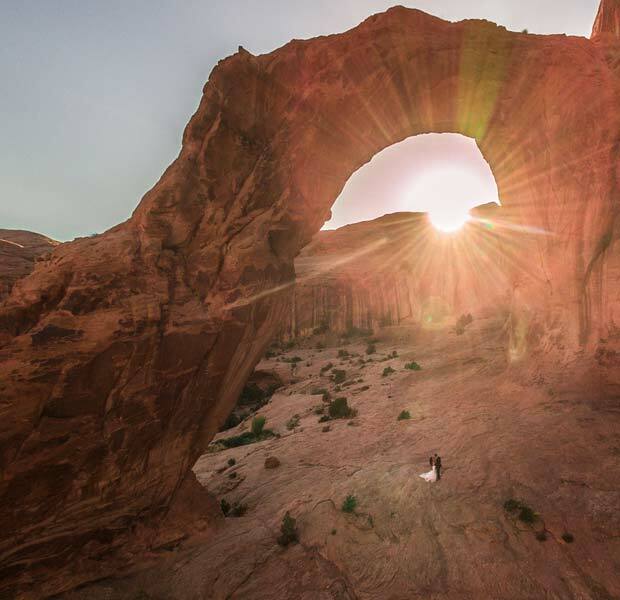 As a photographer if you are planning to shoot wedding photography with drones, then you need to know what wonders you can create with it. The normal portraits and aerial portraits of couple are completely different. The ring close ups and shiny jewellery shots are very common. However, photographers used to struggle a lot by using camera stands and other tools to capture different angles of the ceremony. 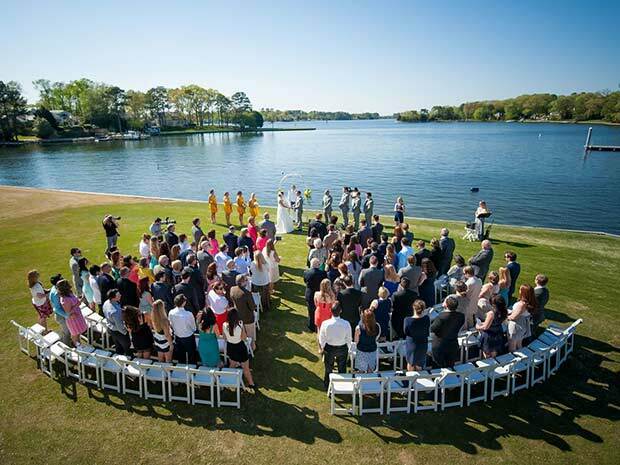 It’s simple with the drone to capture the aerial view of ceremony for the couple. You can also cover the guests, venue and background in the shot. Credits: The KnotIn the outdoor day shoot, you’ll get the natural light to help with the photos. However, you should check out this guide on photography lighting. For beach weddings, you may have seen hundreds of wedding photos where the photographer captures the sea in the background or aside the couple. However, when shooting with a drone, you can capture from the other side. 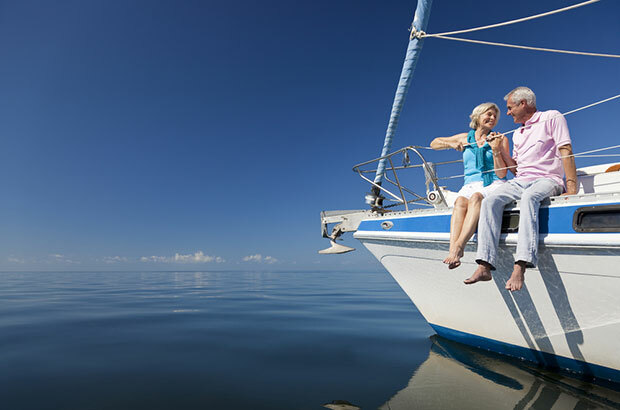 Fly the drone above the sea and capture the couple on the shore or with the city in background. It’ll come out as the photographer is surfing in the sea with the camera and the results will be amazing. Drones make it easier for you to shoot from any angle and height. However, you still need to know the range of your drone and the camera details for good shots. 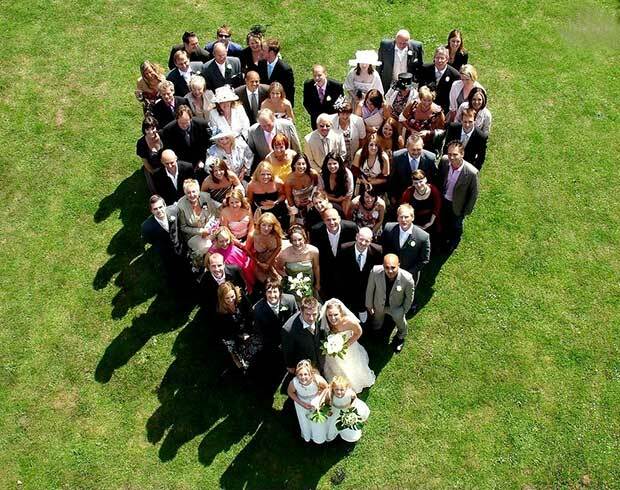 Any photo that you capture for the couple from aerial view is great. In the aerial photos, earth is the background for you that can give great result. As you can see in the above image, the couple is walking on a bridge connecting the venue in the water. It looks mesmerizing and no camera can capture this angle without massive efforts. You can also use the drone to shoot random small clips and garden shots of the couple talking to each other. With the bridesmaids and groomsmen.. These wedding photography poses and shots will make your photography business stand out from the crowd and your happy clients will get you more leads. 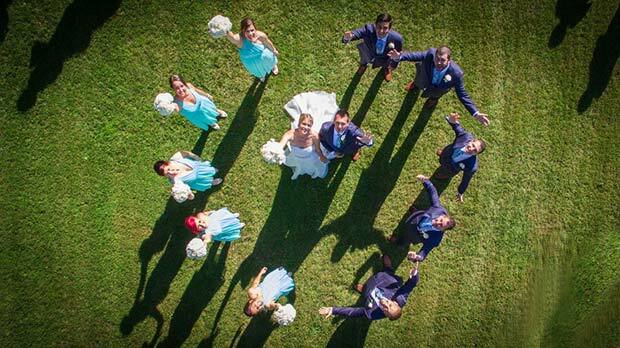 Since shooting a wedding with drone isn’t what you do every other day, you need to make sure a few things that will help you in getting along easily with the aerial wedding photography poses. Safety Measures: Weddings are rush places, so make sure that you fly the drone safely without getting anyone injured with it. Though, you can practice it on the venue before the shoot, it will be different with the people hanging around in the ceremony. Drone Insurance: Is it a must? Yes. It will save you from any bad circumstances. If you hit someone by mistake (that’s rare), or if the drone get damaged with some object, then you’ll be protected under insurance. That’s all. 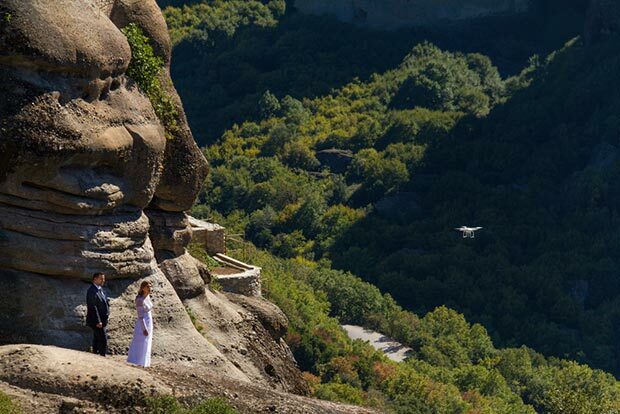 We hope this guide has helped you to find the best aerial wedding photography poses for couples. You may also want to check out our guide on what are the best camera settings for wedding photography.